Create defined feeding spots for squirrels in your garden using these Woodlink Going Green Squirrel Munch Boxes. Offering squirrels corn and peanuts can sometimes prevent them from raiding your bird feeders, and these two stations harness the inquisitive nature of these animals. Their recycled plastic frames form hardy and environmentally sound feeders, and the square chamber of each holds 1.4 quarts of peanuts in the shell or cracked corn. Squirrels can see the food through the front, clear plastic panel, and the extended platform supports them. They must open the hinged lid to reach the feed, allowing you to enjoy their antics. An upright screw on the platform holds an ear of corn for an extra treat, inviting even more squirrels to visit the stations. 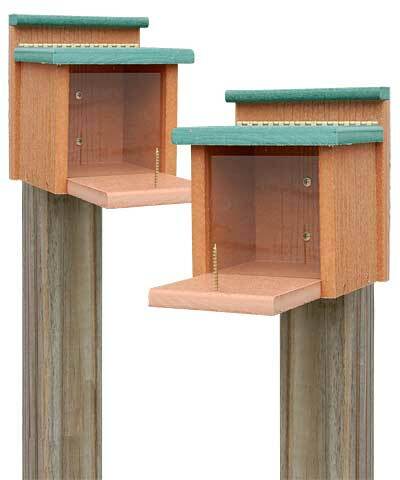 The hardy, recycled plastic construction of each feeder remains durable for many seasons without warping or rotting, and they attach to a post or tree in moments. The brown and green color scheme echoes that of your landscaping, and the items refill and clean with ease. Offer squirrels two dining spots in your backyard with these Going Green Squirrel Munch Boxes. Made in the USA. Note: This case pack includes 2 of the Woodlink Going Green Squirrel Munch Boxes.